Elements by Weiser® provides an expanded choice styles and finishes at an affordable price. The smooth simple lines of the Belmont lever and wave style design is an attractive addition to any home. This half-dummy, or trim function, is surface mounted on doors where only a pull is required. The lever is not reversible and can be mounted on right-handed doors only. The Venetian Bronze finish is hand-rubbed to reveal unique bronze highlights and provides a rich and warm complement to the Belmont's style. 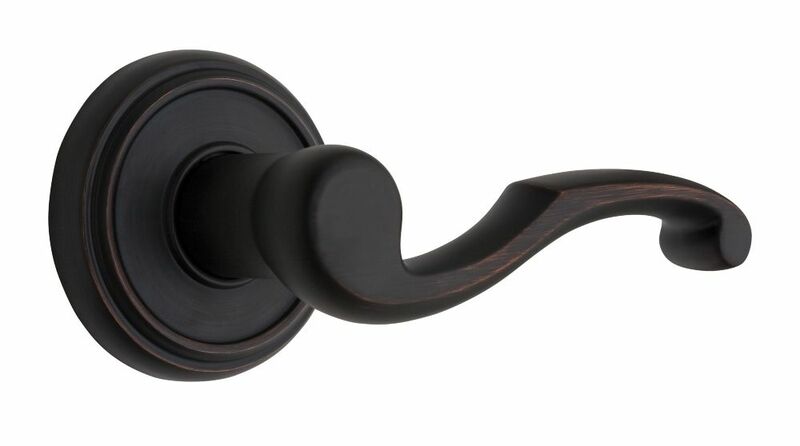 Maya Dummy Lever in Venetian Bronze Collections by Weiser offers five handlesets to choose from. These handlesets offer solid forged brass construction and Grade 1 cylinders for uncompromised security. The decorative details incorporated into Mayas elegant, sweeping shape make it the perfect finishing touch to classic designs. This half-dummy, or trim function, is surface mounted on doors where only a pull is required. The Venetian Bronze finish is hand-rubbed to reveal unique bronze highlights and provides a rich and warm complement to the product's style.